Centuries of Japanese tradition and excellent cutting properties are combined in these stunning knives. Seki Magoroku Redwood includes all known knives of the Seki Magoroku series as well as seven new double-edged additions. Kai knows how to make knives! The Seki Magoroku Redwood series captivates by its mirror finished blade made of top quality steel with a hardness of 58±1 HRC and the exquisitely polished edge that gives the series a high cutting performance. The blade is very thin which makes it amazing to work with. A big difference when compared to European kitchen knives which are usually a little thicker. The back of the blade is rounded, the edge is razor-sharp. These knives will fly through your food. The Redwood handle is waterproof and has a traditional chestnut-shape. The polished crop perfectly matches the natural colour of the wood. This hardwood naturally has high oil content and is therefore water resistant. The polished polypropylene bracket adds harmony to the wood's modern colour. With the Seki Magoroku Redwood collection you will take home Kai quality products for amazing prices! Utility knife.Overall length: 27 cmBlade length: 15 cmHardness: 58±1 HRCHandle length:&nbs.. Chef's knife.Overall length: 28.4 cmBlade length: 15 cmHardness: 58±1 HRCHandle length:&nb.. 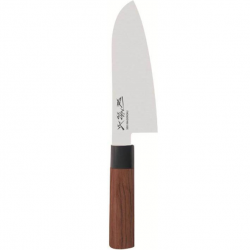 Chef's knife.Overall length: 33.4 cmBlade length: 20 cmHardness: 58±1 HRCHandle length:&nb..
USUBA is Japanese for: vegetable chopper. The USUBA blade shape is traditional for Japanese vegetabl..
Slicing knife.Overall length: 32 cmBlade length: 20 cmHardness: 58±1 HRCHandle length:&nbs.. Bread knife.Overall length: 34.5 cmBlade length: 22.5 cmHardness: 58±1 HRCHandle length:&n..
Yanagiba is Japanese for: willow leaf blade. The Yanagiba is traditionally used in Japan as a slicin..